Dress up your Spring with Kalalou! We have a lot going on in the Atlanta this week! If you're in the neighborhood, you should definitely stop by to see over 475 new products, an awesome show special, and a fantastic giveaway! We hope to see you there! 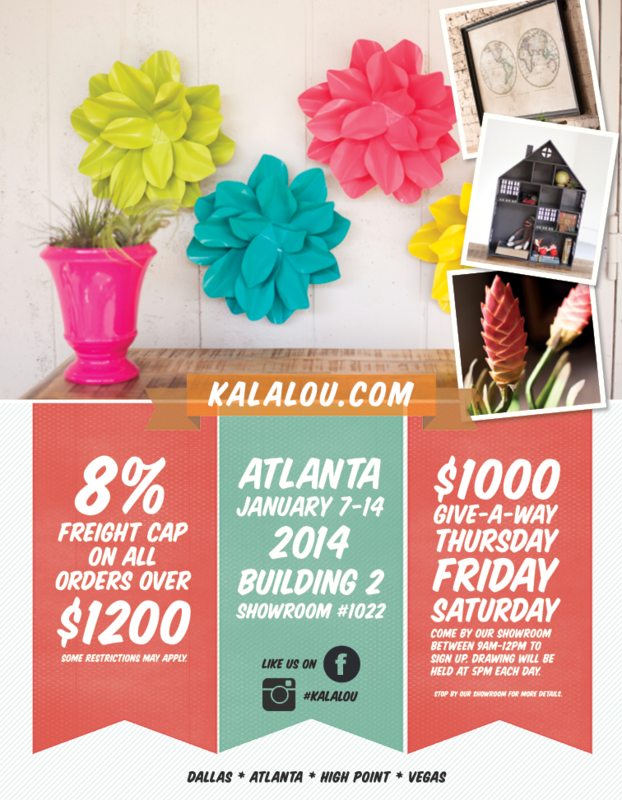 • One $1000 kalalou shopping spree will be given away each day on Thurs, Fri, and Sat. • Participants must sign up in the kalalou showroom between 9am and 12pm daily to be eligible for the drawing. This means that if you sign up on Thursday, you are eligible to win on Thursday only. You must sign up again on Friday to be eligible to win on Friday. • The drawing will be held at 5pm each day. • You do not have to be present to win. • One entry per day. • You are only eligible to win once.